The model can be seen in the movie The Mighty Wind! An Oscar Schmidt tradition, this classic 1930's reissue truly distinguishes itself from all the rest. It gives a classic feel to a brand new instrument. The AC448 is a fully insulated case constructed with high impact stro-foam covered in black gig bag material. 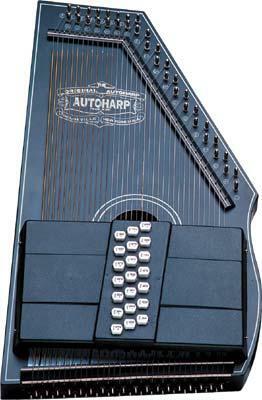 It has shoulder straps, a pouch, and is form fitted for all models of Autoharp. A heavy-duty zipper keeps the instrument secure and well sealed within. This case is lightweight and is easy to handle yet it offers maximum protection. Flat Shipping $14.95. This vintage-style, vinyl-covered hardshell autoharp case is a must for your classic autoharp. A padded black plush interior protect your instrument from scratches and damage. The classic stitched leatherette-style ends and carrying handle are top quality, and the brass-finish latches and corner reinforcements are made to last. Complete with a self-closing interior accessory pocket for tuning wrench, picks and accessories. AS OF APRIL 10TH THERE IS A ONE MONTH WAIT FOR THIS CASE AS OSCAR SCHMIDT BUILDS A NEW SUPPLY. WE CAN RESERVE ONE FOR YOU AND SHIP AS SOON AS THEY BECOME AVAILABLE. AC445 Nylon Padded Autoharp Gig Bag fits all Oscar Schmidt models except OS73.